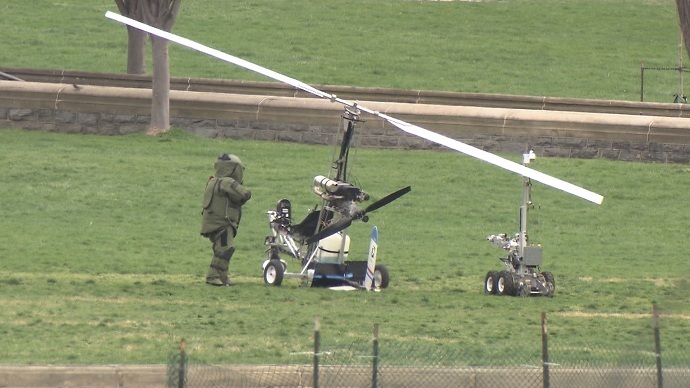 Police arrested a man in front of the United States Capitol in Washington, DC on Wednesday afternoon after he landed a small gyrocopter on the west lawn of the building. Eyewitnesses near the US Capitol saw police rush to a greenery on the east end of the National Mall early Wednesday afternoon after the craft landed. The pilot was apprehended at the scene. Police have not yet identified the man, but the aircraft’s pilot is said to be 61-year-old Doug Hughes of Florida. According to a Tampa Bay Times profile of the man, published as his flight began on Wednesday, the event was meant to protest the Supreme Court’s 2012 decision in the Citizens United case. The newspaper had published a profile about Hughes on account of his plans to “draw attention” to the Citizens United case in which the high court ruled that corporations can contribute endlessly to political causes. According to the paper, Hughes had brought his gyrocopter from Florida to an area outside of DC late last week. On Wednesday, he planned to “to buzz through the air at 45 miles per hour at about 300 feet up in an ultralight gyrocopter toward Washington, D.C., toward protected airspace, where, if his plan works, he'll land on the lawn of the United States Capitol building and deliver the mail,” journalist Ben Montgomery wrote. The Times described the gyrocopter as lightweight aircraft fitted with un-powered helicopter blades on top for lift and propeller on the back for thrust with a wide-open cockpit. "This is as transparent a vehicle that I could come up with," Hughes said. "You can literally see through it." Congressional staffers reported that the area was placed on lockdown on Wednesday as authorities rushed to apprehend the pilot and make sense of the scene. According to a local ABC News affiliate, the White House was also placed on lockdown as a precautionary measure.